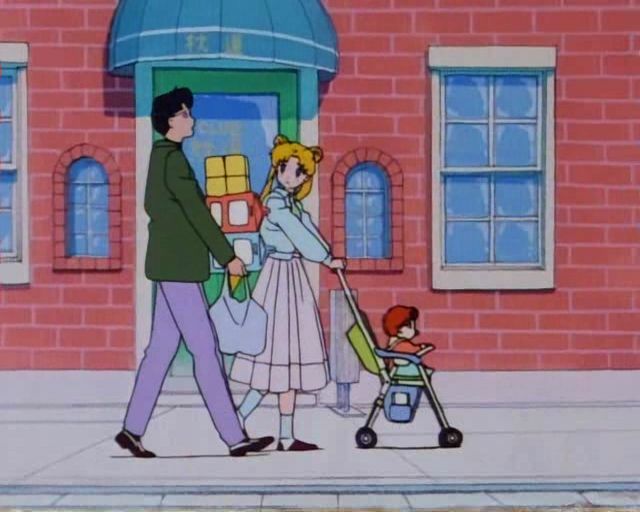 Specifically, we’re talking about episode 53 (episode 7 of Sailor Moon R), wherein Usagi and Mamoru are entrusted with taking care of little baby Manami. I’m not really in the business of doing episode summaries – and I’m sure that most of you, dear readers, have seen the episode – so I’ll keep this brief. Basically, the episode centers around Mamoru and Usagi dealing with the trials and tribulations of having to care for a baby. Considering that Mamoru has no family at all and that Usagi and Shingo are so close in age, this makes them pretty bad candidates to take care of a child. Anyone familiar with raising children3 is probably familiar with the not-so-enjoyable experience of having a little human pee on you, and I think the anime does a good job capturing the horror. But even more importantly, it does a great job of showing how the responsibility over caring for a baby pulls Usagi and Mamoru together. It’s all pays off in the end when they are both able to share in the joys of watching Manami take his first steps and utter his first words. Read also: Why Did Usagi Become Queen of Crystal Tokyo at 22? Now, what’s the point in all this, and why am I rambling so long? Well, it turns out that this whole episode was inspired by Toru Furuya’s experience in raising his own daughter, who was born in April 1992.4 That’s right – the voice of Tuxedo Mask was busy raising his first daughter around the time Sailor Moon started! Also of interest is the fact that many of Moonlight Knight’s speeches were either left up to Toru, or he just went off script and ad-libbed them on his own anyway.6 His lines in this episode were specifically on-mark as words coming from a doting father. I can’t help but imagine that was the case here. Once again, another interesting line that is possibly a look inside the head of the voice behind Tuxedo Mask? The last thing I have to say about this is that I find it a bit odd that this episode is supposed to focus on Ami (since this is when she gets a new power), but she has such a small part in this episode. She takes a back seat while Mamoru and Usagi address their own relationship. However, the more I think about this, the more I have to say that it’s very… Ami-ish of her to do that. Rather than jumping in and volunteering to help out with the baby – which you know she must know something about! – she lets Usagi pursue this to spend more time with Mamoru. Good for her! Read also: Are the Sailor Soldiers' Bust Sizes Unrealistic? There’s not much more to say about this episode, but I thought it was a neat fact to share. This isn’t the only time where the real-life circumstances of people working on the anime had shown up in Sailor Moon, but I think I’ll wait until next time before going into that. ← Why Was There No True Leader of the Sailor Team? Thanks! You’re absolutely right. I tend to proofread what I blog exactly… never. =p It’s a bad habit. Fixed! That was one of my favorite episodes. I love how funny and cute Mamo and Usagi are in that episode. 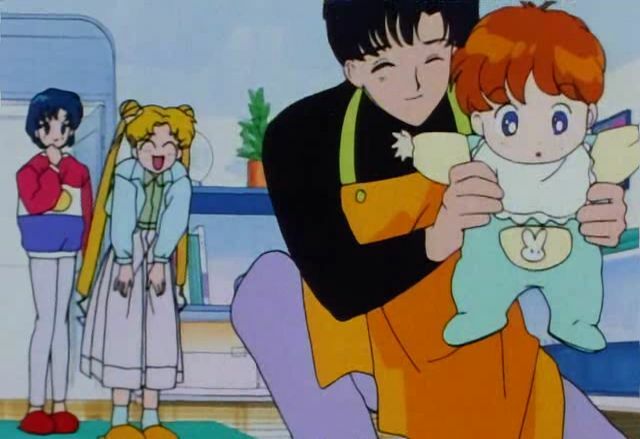 I wish we could see them as new parents with baby Chibiusa just because you know it would be really heartwarming and hilarious. And speaking of Ami, I love her getting to show her mischievous side in the episode when she teases that the baby is Usagi and Mamo’s and makes Usagi get all flustered and that’s something that happens after Ami was present for Mamo making the decision to take care of Manami and her knowing Usagi would be helping. 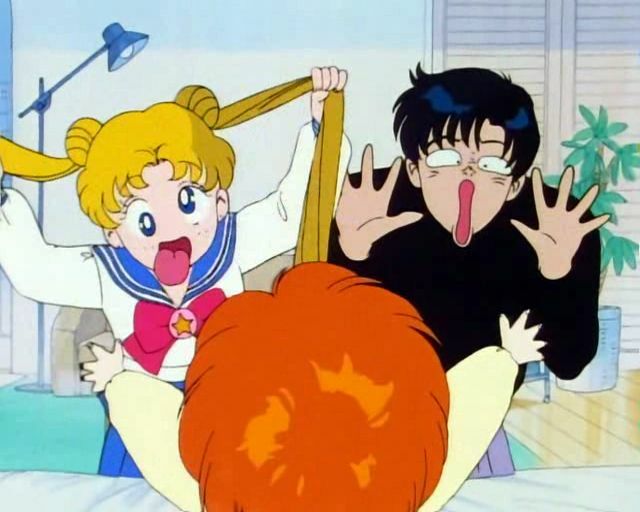 So it was just funny that she was like, “Haha, I’m only kidding!” when Usagi started acting all goofy.